Just Dial Ltd is India's leading local search company that offers information on local businesses to consumers via voice, mobile and internet. We dug into its IPO filings (the company got listed recently) to see how internet savvy the business is. The company, although started its business in 1996, launched its website Justdial.com only in 2007. It started with a paltry 360,000 visits in the debut year, but has been growing at a frenetic pace since then. 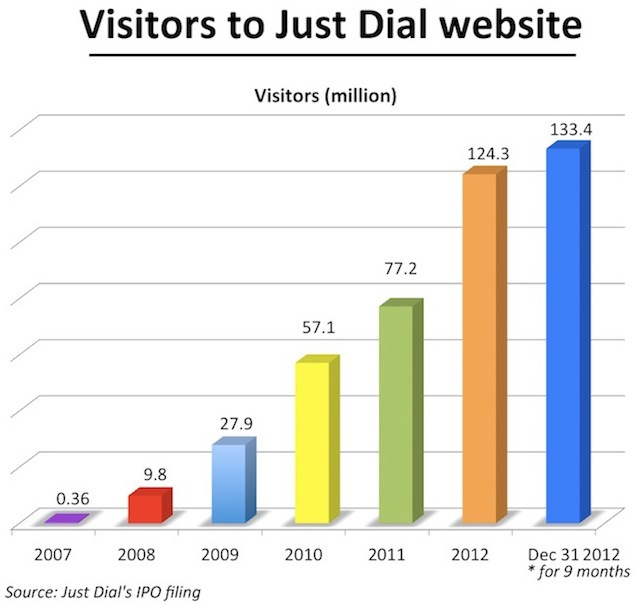 The number of visits went up multifold to 133.4 million in the first nine-month period ended December 31, 2012 (see chart). Note that the visits mentioned here simply represent the number, as against unique visitors (meaning it can be repeat visits by the same users). However, the local search company is betting on the internet for its future growth. Interestingly, in the nine-month period ended December 31, 2012, approximately 50 per cent of the total number of search requests for Just Dial were conducted through the company's internet-based service. The site accounted for 49 per cent, 43 per cent and 43 per cent of the total search requests in FY2012 (the year ended March 31, 2012), FY2011 and FY2010, respectively. The company also claims in its filing that it employed a technology team of 281 people as of March 31, 2013, who focus on maintaining and upgrading the website, and the software used internally by the company. The search software provides a predictive auto-suggest feature that anticipates users' needs and highlights associated and other relevant products & services in the search box. Users are provided a list of search results, which can then be accessed by clicking on the hypertext links displayed. While none of its competitors is as large as Just Dial, the company competes with the likes of ZatSe, Asklaila and Getit in the Indian market. In addition, it also faces competition from Google's local search, which also provides details on local businesses. The Mumbai-based firm, which grew from Rs 71.6 crore in 2008 to Rs 277 crore in 2012, primarily makes money from businesses that pay for listing their companies/businesses with the search firm and also for generating leads. Consumers get information for free although Just Dial passes on the leads with contact information to the businesses. As of March 31, 2013, the company's database had approximately 9.1 million business listings across various cities and towns in India, compared to 7.2 million business listings in the previous year. Earlier this month, Just Dial listed at 11.1 per cent premium to issue price to become the largest listed Indian internet firm, overtaking Info Edge (India), which runs the job portal Naukri.com, as well as other sites. But earlier this week, the company's shares slipped 2.22 per cent at close of market after reaching a new high on Tuesday (June 11) even as brokerage Nirmal Bang put the firm's target price at Rs 800, giving it a valuation of around $1 billion.